The CIPD’s Annual Conference and Exhibition (ACE) proved to be the perfect opportunity to inspire learners interested in taking their next step on the career ladder with cHRysos HR. The prestigious event, hosted by the official body for HR professionals, was held at the Manchester Central Conference Centre between 7-8 November 2018. 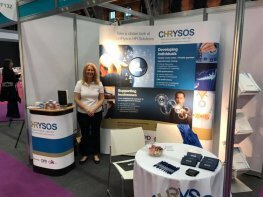 It gave cHRysos HR the opportunity to showcase their new display stand informing event goers about apprenticeships in HR, Management and Learning & Development. Julie Gordon, Managing Director of cHRysos HR, said: “The CIPD ACE is always a highlight in our calendar at cHRysos HR because it’s inspiring to see so many people come together with ambitions to develop not just their own careers but the opportunities available for their peers too. “The five key themes covered everything from strategic HR and ethical decision making, how technology will impact the world of work, organisational development, nurturing skills and employee wellbeing. “It was incredibly interesting to be able to tap into so many different themes and I was particularly keen to hear how organisations are working towards creating better working lives for employees. cHRysos HR was amongst 180 organisations from across the country which showcased products and services to industry professionals, particularly those who are continually inspired to change and adapt to new skills, technology and practices. Baroness Shami Chakrabarti, Shadow Attorney General for England and Wales, talked about the reputational risks of data security and Sir Lenny Henry, comedian and Chancellor of Birmingham City University, delivered an inspirational speech about diversity and inclusion.